Look, use, want, and need – what do these words have to do with Pinterest? In ““I Need to Try This!”: A Statistical Overview of Pinterest,” authors from Georgia Institute of Technology and University of Minnesota examine Pinterest using three questions: They asked what makes certain “pins” succeed and others fail, they asked what the structure of social connection is on the site, and they compared Twitter and Pinterest. Some of the results are pretty surprising – others, not so much. What makes a winning pin? According to the study, being a female helps you get more re-pins, as does being from the U.S. and the U.K. This is because most users are female, and most users are from those two countries – and people tend to re-pin things they’ve seen on their friends’ accounts. More popular users have a wider audience base. 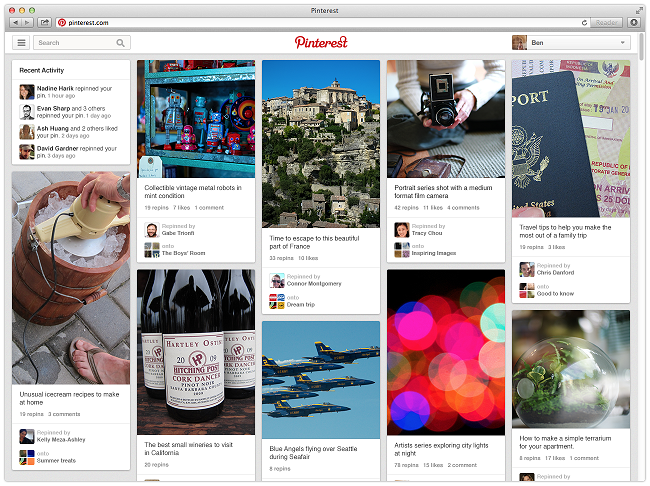 There’s a common misconception that Pinterest is a women’s-only site. Or at least totally dominated by women. But that’s not true – at least, not totally true. The researchers reported that 80 percent of their sample pinners were female, so women definitely have a super-majority. But in Europe, the gender balance is better than in the U.S., and you can’t discount the 20 percent portion of the audience that is male – they actually tend to have a higher mean follower count than women. A social network’s a social network, right? Not really – while there’s plenty of overlap, when the researchers compared Twitter and Pinterest, obvious differences came to light. They gathered 200,000 pins and 700,000 tweets and looked at what people were talking about on each social network. Even though it’s all virtual collecting, Pinterest positions its users as consumers much more so than sites like Facebook, Twitter, and LinkedIn do. Those four verbs make Pinterest stand out because they highlight how so much of the network’s appeal is grounded in the idea of acquiring stuff. When the researchers compared Pinterest and Twitter, they did a textual analysis that showed how Pinterest users talk about possessing and observing things, whereas Twitter users favor words like “now, tonight, watching, going,” which suggests Twitter is more about commenting on timely events, and about action. Pinterest grew at a rapid clip at first, but now the user base is leveling off – it’s not the shiny new social network anymore. And even as it adds stuff like a native analytics service, it will have to compete with a slew of competitors that are even more tuned in to turning pins into purchases. Since Pinterest users are substantially more focused on looking at and bookmarking beautiful things, it’s likely that Pinterest will lean into its potential as a jumping-off point for online shopping – a move that will further separate it from Twitter but make fans who use, look, want, and need the items they pin very happy.